Republished from Venezuelanvoices. See their web site for other reports from inside the country. Author: Simón Rodríguez | Original text in Spanish: laclase.info, 20/03/2019. Under the global spotlight for the past two months, Venezuela is perhaps the most debated and at the same time misunderstood country in recent times. The truth embraces demanding paradoxes: a country ruined but rich in resources, with a civilian-military dictatorship kneeling before transnational capital, but claiming to be “socialist” and “anti-imperialist,” where a “worker president” has imposed capitalist semi-slavery working conditions, and where the new Chavista bourgeoisie and the traditional bourgeoisie live in the most obscene privilege, while the majority of the population is subjected to misery. It is a country hostage to a civilian-military dictatorship, and at the same time under siege by the USA. For every fundamental fact in the nation´s daily reality there are two mutually exclusive versions, plagued with falsifications that are functions of the propaganda war key to the dispute for power. This is the dense fog that has to be penetrated in order to appreciate the reality in Venezuela. Between blackouts and precarious Internet access, and in the heat of the political vortex, we will try to appreciate the unstable and changing situation. While these lines were being written, a conference was held in Rome between representatives of the US and Russian governments to discuss the Venezuelan crisis, which as expected, ended without agreement. At the same time, on the table there is an unscheduled call by the bourgeois opposition to march towards the presidential palace of Miraflores, in Caracas. On January 23, hundreds of thousands of Venezuelans took to the streets and an almost unknown member of the National Assembly proclaimed himself interim president, with the support of the U.S. and right-wing governments in the region. The main concern for large sections of the world left was that we were facing a pro-imperialist military coup, like the one in April 2002. This unilateral bias led them to take Maduro’s side. Contradictorily, what drove the vast majority of those hundreds of thousands to take to the streets was not support for a coup but, from their point of view, the recovery of the democratic rights reversed by Maduro’s government. On the other hand, more than two months later there has been neither a military coup nor a significant break in the repressive apparatus. We have arrived at a sort of equilibrium, which cannot last long, between the opponents. Let us review the origins of the current political crisis. After three years of the most brutal adjustment plan to be suffered by the Venezuelan people in their history, through which Maduro drastically cut wages and public spending to pay off foreign debt, in December 2015 an exhausted population used the ballot box to punish the government for its pseudo-socialist doublespeak and brutal repression, as seen in both the smashing of the 2014 protests and through the Operación Liberación del Pueblo (People’s Liberation Operation) in the poorest neighborhoods, which resulted in hundreds of extrajudicial detentions and executions. This is how the bourgeois opposition obtained two thirds of the National Assembly. In anticipation of and in the months following its electoral defeat, the government reacted by appointing several members of the Supreme Court to secure an unconditional majority, stopping a presidential referendum contemplated in the Constitution via swindling and maneuvers, nullifying the election of opposition representatives in the Amazon state to eliminate the two-thirds majority, and finally through a series of court decisions and presidential orders, eliminating all the parliament’s powers. In other words, Maduro didn’t recognize his resounding electoral defeat, eluding it through a coup. With the support of the army, he suspended constitutional guarantees indefinitely. The regime was transformed into an open civilian-military dictatorship, albeit with the weaknesses and contradictions resulting from its internal disputes. Important sectors of the Bolibourgeoisie were displaced from power. The gangster Rafael Ramírez was removed from the head of the oil ministry and the state oil company, Pdvsa; heads of repression and intelligence such as Miguel Rodriguez Torres and Hugo Carvajal were removed, former Vice President Elias Jaua would also be marginalized. General State Attorney Luisa Ortega, architect of the criminalization of protests, quit in the middle of the 2017 mobilizations. A dissident wing of Chavismo emerged, calling itself “critical” or “original”. Both changes in the regime and the reduction of state income in the context of falling international oil prices intensified the inter-bureaucratic and inter-bourgeois conflicts within Chavismo, strengthening the military wing. The bourgeois opposition grouped in the MUD, mostly coopted through corruption, capitulated to the government throughout 2016, succumbing to all its maneuvers. At the end of the year it even went so far as to sign a joint statement with the government, after long negotiations, in which it accepted all the official theses, even a commitment to collaborate in the area of economics. In March 2017, a judicial decision granting Maduro legislative powers and authorizing him to hand over oil and mining licenses to transnational companies without going through parliament forced the MUD coalition to call for mobilizations, control over which they quickly lost, as these exploded into massive riots and looting. Trying to hold back the popular rebellion, the MUD capitulated to the government again, agreeing to negotiations that Maduro took advantage of to gain time and divide the opposition. The government managed to bleed out the protests, killing more than 140 people, wounding and imprisoning thousands, using torture and military trials on a large scale. He sealed his victory by imposing a National Constituent Assembly with executive, parliamentary and judicial functions, with 100% pro-government members, ratcheting up a notch the dictatorial nature of the regime. However, it would be a pyrrhic victory due to the continuous worsening of the economic and social disaster. The self-proclaimed “anti-imperialist” international Left not only silently endorsed Maduro’s austerity plan to pay foreign debt on the basis of hunger, while Maduro was carrying out a reactionary coup d’état, they were railing against another coup… of which Maduro was supposedly a victim! The revolutionary socialist tendency of the International Unity of the Workers-Fourth International, whose organization in Venezuela is the Socialism and Liberty Party (PSL), was consistent in denouncing Maduro’s adjustment and coup, and supporting the popular rebellion of 2017, for which it endured not only the persecutions of the government but also the slanders of those renegades from socialism for whom fighting against Maduro was “playing the game of imperialism”. Maduro’s coup in the political arena had its economic parallel in an acceleration of the murderous adjustment process. Between 2013 and 2018, Maduro paid more than 80 billion dollars in foreign debt, reducing imports by more than 80%. Wages were reduced by more than 90%, to less than 10 dollars a month. To get an idea of the cut applied to education and health, by 2019 the annual budget to cover expenses at the University Hospital of the University of the Andes was less than fifteen dollars. Maduro’s extreme subservience to Wall Street’s financial vultures, in addition to belying his “anti-imperialist” claims, also ended up sinking the Venezuelan economy. The GDP was halved. The government’s decision to reduce the supply of goods, cutting imports and national production, as well as the attempt to cover the budget deficit through a vertiginous increase in the mass of money in circulation, fed an inflationary spiral that lead to hyperinflation, with a monthly rate of more than 50% in October of 2017. The social consequences of this economic policy were brutal. One tenth of the population, more than three million people, mostly from the poorest sectors, have left the country in the last five years, seeking to survive and be able to send remittances to their families. Infant and maternal mortality rates have risen to levels not seen in fifty years. Undernourishment rose dramatically, with the majority of the population experiencing large weight losses. To cover up this economic counterrevolution and the worst setbacks suffered by the working class currently anywhere in the world, Maduro’s government invented the false theory of an “economic war”, a supposed external and internal sabotage of the economy. The first U.S. financial sanctions were applied in the second half of 2017 and the first oil sanctions in January 2019. Although these were measures of interference that should be repudiated, the truth is that by then the economy was already in ruins. The causes of the disaster are in the Chavista model, which squandered the greatest oil boom in our history. Enormous revenues were not only lost to the transnationals operating in the Venezuelan oil industry, through the formula of the mixed enterprises, import subsidies added to the plunder, as these resulted in a capital flight of more than 350 billion dollars following the currency exchange controls applied in 2003. The looting was on such a scale that the crisis began to become manifest even before oil prices fell below 100 dollars per barrel. After that, Maduro’s adjustment did the rest. In 2017, the National Assembly and the MUD took steps towards challenging the government’s legitimacy, such as the parliamentary declaration of an “abandonment of office” by Maduro, as well as the holding of a plebiscite to endorse the formation of a parallel government. However, the U.S. government responded by clarifying that it would only recognize Maduro’s government, and since the MUD is completely subordinate to U.S. imperialism, it backed down. The top US officer for Latin America, Thomas Shannon, visited Caracas on several occasions and gave his support to the dialogues between the government and the MUD. The collapse of the opposition bloc as a consequence of its capitulation in 2017 postponed a new political crisis until the beginning of 2019. The year 2018 was one of great workers’ struggles against poverty wages. In May 2018 a fraudulent presidential election was held, illegally called by the National Constituent Assembly, with the majority of the opposition leaders and parties outlawed and which was boycotted by the vast majority of voters. The decision of the bourgeoise opposition to not recognize Maduro’s new mandate in January 2019, and to declare the president of the National Assembly, Juan Guaidó, as interim president of the country, was handed down from the United States. Statements by opposition leaders such as Capriles, as well as reports by media free of any suspicion of Chavismo, such as the Wall Street Journal, show that the move was decided behind the backs of the majority of the bourgeois opposition, by a conclave of four opposition leaders in agreement with Trump’s government: Leopoldo López, María Corina Machado, Antonio Ledezma and Julio Borges. The move was so openly directed by the Yankees that the leadership was handed over to the Lima Group, which is composed of right and center-right governments in the region, who called upon Maduro to hand over power to parliament on the 4th of January. Formally, the National Assembly claimed to be implementing the figure of the interim president, who according to the Constitution must hold an election within 30 days, which evidently did not happen. Thus, in the words of the web publication El Disidente we became, “the only country with two illegitimate presidents”. The Chavista government, beyond having acquired relative political independence from the US after the 2002 coup, never had anti-imperialist or socialist policies. On the contrary, it favored Chevron with the largest oil licenses and subsidized General Motors with more than 6 billion dollars for imports. As we have already seen, it proved itself capable of imposing the worst privations on the people in order to pay the foreign debt. When the possibility of oil sanctions was discussed in 2017, it was the U.S. oil companies’ own lobby that asked the Trump government not to apply such sanctions. Why then has Trump made an attempt on political power in Venezuela? We could adapt a popular adage to say, “this is how imperialism pays those who serve it well.” There are both domestic and foreign policy reasons for this orientation. The generalized collapse of the country has fed concerns about avoiding a disorderly collapse of the Chavista regime, under an onslaught of popular mobilization, which would generate very difficult conditions for rebuilding capitalist governability in a post-Chavista scenario. These are the same concerns that in 2017 prompted imperialism to prioritize a negotiated solution. They are reflected in Guaidó’s current orientation: to carry out limited mobilizations without directly confronting the headquarters of political and military power, to exert economic and diplomatic pressure, together with threats of military aggression, and to extend a promise of amnesty for the crimes of corruption and repression to those in the military in anticipation of a coup. All pointing to a way out from above that deprives the people of the possibility of leading a struggle based on their own interests. Already in 2018, the far-right tycoon had proposed to his advisors to invade Venezuela, although without obtaining their approval. A reconfiguration of Trump’s government team with the entry of figures more in tune with his perspective, such as John Bolton, opened up the possibility for adopting a more aggressive line. The Venezuelan debacle presents him with an opportunity to distract from the internal political and even legal problems that harass the deranged head of imperialism. Added to this are the potential electoral votes from the state of Florida, the traditional seat of a right-wing vote of Cuban origin, which factor in the pre-campaign for the presidency. From the strategic point of view, there is the opportunity to install a puppet government in a country of importance due to its location and great natural resources. The presence of extreme right-wing allies in Colombia and Brazil and a docile Lima Group also favor the expanding intervention. While Venezuela never ceased to economically be a Yankee semi-colony, with the U.S. as its main trading partner and debt creditor, at least until the oil sanctions of January 2019, it is no less true that the economic destruction under the Maduro government has reached a point that it poses a problem for the imperialist companies, despite these having benefited for many years from Chavista policies. Oil production has fallen from three million barrels a day to just over one million. The electricity industry is greatly deteriorated, as demonstrated by the blackout in March. The possibility of benefiting from a recovery of oil production, from large privatizations of public companies, of expanding its participation in the oil industry through a partial privatization of PDVSA following the model of Petrobras, as has been suggested by the economic guru of the Venezuelan right, Ricardo Hausmann, all of this represents a very tempting economic opportunity for imperialism. Trump combines oil sanctions that will drastically aggravate misery with “humanitarian” demagogic propaganda to disguise the Yankee government as a benefactor of the Venezuelan people. 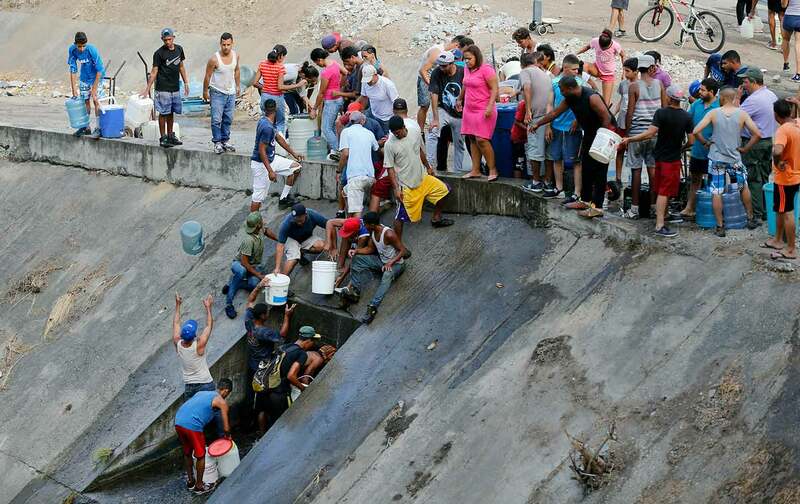 Reports from The Economist and Anatoly Kurmanaev of The New York Times have revealed that there are actually no medicines and a minimum amount of food in the highly publicized warehouses in the Colombian city of Cúcuta. The provocation operation of February 23rd, which simulated an attempt to pass humanitarian aid to Venezuela and ended with the burning of two truckloads in confusing incidents at a border bridge, was another step in the escalating intervention. The government carried out repression, with its usual brutality, particularly against the indigenous Pemón community on the border with Brazil. The defeat of 2017 weighs on the collective conscience and contributes to political backwardness, with important sectors of the population having illusions in the interventionist and pro-coup policy of Guaidó. A situation diametrically opposed to the one portrayed by the U.S. Embassy in Venezuela in the cables released by Wikileaks a decade ago, when U.S. officials complained about the very strong popular rejection of U.S. interference in Venezuelan politics. The Venezuelan government is responsible for this tendency towards a stronger right-wing, after many years of applying an ultra-reactionary policy with “left-wing” makeup and crushing any possibility for popular and workers’ self-organization. In spite of this, there have also been demonstrations of popular resistance, which neither wait for direction from the right nor obey the pacifist recriminations of the bourgeois parties. This is demonstrated by the protests during the week of January 21st in the popular neighborhoods of Caracas, which were savagely repressed by the special groups of the FAES, resulting in more than 30 murders, and the mobilizations of the Pemón people in February, as well as the spontaneous protests against the great national blackout in March. On the one hand, there is the legitimate repudiation of Maduro’s government by between 85% and 90% of the population, including the enormous majority of the workers and popular sectors that were once the social base of Chavismo, and for whom the struggle against the hunger-imposing bourgeois government is a struggle for survival. At the same time, there is the dispute for power between the civilian-military regime and a political leadership led directly by the US, in which, very secondarily, there is also a conflict with China and Russia, allies of Chavismo. China is creditor of around a third of the Venezuelan foreign debt and has oil investments; Russia is a supplier of military equipment and also an oil partner. At the time of the January sanctions both were well behind the U.S. in terms of trade with Venezuela. Without any expectation of the civilian-military regime’s ability to recover, they have retreated from the Yankee oil sanctions, as shown by the business freeze announcements by the Russian company Lukoil, and China has not responded to funding requests to the extent hoped by Maduro. They have not raised the stakes beyond jockeying in the diplomatic arena, of which the greatest example is the February 28 veto of a U.S. resolution at the UN. For Russia, facing Yankee sanctions for its annexation of the Crimea and its aggression against Ukraine, and involved in a genocidal invasion in Syria, Venezuela represents an important bargaining chip. The Venezuelan government has said it is willing to accept the proposal of the governments of Mexico and Uruguay, sponsored also by the European Union and the Vatican, to undertake negotiations with the National Assembly. According to the Communications Minister, Jorge Rodríguez, the government places some preconditions such as the lifting of the oil sanctions. In February, Venezuelan Foreign Minister Jorge Arreaza admitted that there are secret negotiations between the Trump and Maduro governments. Although no agreement was reached, the Russian-Yankee summit in Rome was another example of negotiation. The successive declarations of the Lima Group at its Bogotá summit against an invasion, the special representative for Venezuela, Elliot Abrams, statement to CNN on March 1st that Trump’s government was not seeking the military route, but “financial, diplomatic and political” pressure, and even Guaidó’s comments, after his re-entry into the country on March 4th, are all indications of the search for a negotiated solution, which mark a contrast with the previous insistence on the existence of a military option. We can broadly identify four positions on the Venezuelan crisis. On the one side there is the government position and on the other side the bourgeois opposition, with nuances within sub-sectors of both blocks. For example, in the bourgeois opposition there is an openly collaborationist sector headed by Henry Falcón, who participated in the fraudulent election of May 2018, as well as such hard-right wing sectors as led by María Corina Machado, furiously pro-invasion. But in general, they stand behind Guaidó and Trump. In the government, the crisis is deepening, as evidenced by the recent restructuring of Maduro’s cabinet, which involved the resignation of all its ministers. There are sectors in favor of negotiating an electoral solution with guarantees of impunity, while the hard line prefers to maintain or to delay as much as possible a negotiated solution; up to now they are all behind the duo of Maduro and Cabello. Then there are two minor sectors, the social democrats of dissident Chavismo, gathered around the defense of the Constitution of 1999, which has met publicly with Guaidó and whose policy is centered on the proposal for negotiations to agree on a consultative referendum in which it would be decided if general elections are to be held. This policy, sustained in pacifist arguments, does not contemplate any initiative to promote it from below, not even a collection of signatures. It is simply based on appealing to the good faith of Guaidó and Maduro, without analyzing the concrete bases of their respective policies, an exercise therefore utopian and demagogic. The fourth position is that of the left opposition, which aims to build an autonomous mobilization of both workers and the people in order to defeat the dictatorship while ensuring that the great majorities take their destiny into their own hands. As part of the workers’ movement, it recognizes the working class and popular communities’ genuine and massive rejection of Maduro’s government as a result of its policy of starvation and capitalist semi-slavery. This sector is represented by the Socialism and Freedom Party (Partido Socialismo y Libertad) as well as union activists from the left wing of the Venezuelan Inter-sector Federation of Workers (Intersectorial de los Trabajadores de Venezuela), the largest workers union in the country today. This sector has tried unsuccessfully to promote an independent policy in said labor federation, proposing organizing from below with an independent program for a general strike. Unfortunately, most union leaders have bowed to Guaidó’s policy. Although it is a marginalized position, it is the only one that consistently defends the right of the Venezuelan people to rebel against a corrupt and murderous dictatorship, as a true expression of popular self-determination. It also includes the repudiation of Trump and the Lima Group’s attempts to decide who rules the country and keep open the possibility for a military coup. Unlike the abstract calls for the restitution of the democratic process, it recognizes that in the current context democracy can only be won in the streets, where there is also a struggle for food, access to health care and education, and the right to organize politically and for independent unions. These are the aspirations of the great majorities that are not contemplated in the “Plan País”, Guaidó’s privatization and economic adjustment plan, nor obviously in the model of unlimited looting and semi-slavery currently in force. In response to the crisis, the PSL proposes as a program a workers’ and popular plan with measures such as the non-payment of the foreign debt, fraudulently contracted by the Bolibourgeoisie; the nationalization of the oil industry, without mixed companies; the confiscation of the properties and accounts of corrupt officials; the repatriation of capital; agrarian reform and the restitution of salaries and the labor rights liquidated by Chavismo, among other demands. The weakness of this alternative is explained by the long years of repression against the workers, peasants and indigenous movements, with major events such as the destruction of the National Workers Union (Unión Nacional de Trabajadores), the assassination of several of the main leaders of UNETE-Aragua, the only revolutionary workers federation that carried out regional general strikes against Chávez; the repression against the Yukpa communities in the northwest of the country, including the imprisonment and later assassination of cacique Sabino Romero; the repression against factory occupations such as Sanitarios Maracay, which resulted in a self-managed plant for several months in 2007, and against the occupation of a Mitsubishi assembly plant, in which the government shot two workers. The complicity of the government with the sicariato campaign by landowners [Translator’s note, the use of hired thugs], in which more than two hundred peasants were executed in land disputes with total impunity, was another example. In this context, the majority of the left kept a complicitous silence, when it did not actively join in supporting the repression and attacking the left opposition. This prevented the rise of a strong alternative, by the left, to Chavismo, feeding the right-wing opposition as the only politically and electorally based alternative, to the point of helping it to become a majority, albeit without merits, as it really only capitalizes on Chavismo’s failure. The current perspective is that of an agonizing aggravation of the situation being suffered by the Venezuelan people, if the dictatorship continues on its feet – while surrounded by Yankee sanctions and the threat of a coup. A coup or invasion would give continuity to the looting and would impose new and brutal sacrifices of all kinds on the population, as demonstrated by the entire history of Latin America and the Yankee military interventions in the world. The only way out that would allow not only the conquest of democratic freedoms and social rights currently denied, but also generate the processes of workers’ and people’s self-organization – crucial for the construction of a revolutionary alternative – is that of a popular rebellion. If that possibility is frustrated again by the imposition of an imperialist military aggression, the main task of the revolutionary left would be to defeat the invasion, without giving any support to the civilian-military dictatorship, in an analogous manner to the repudiation of other invasions perpetrated by the United States, such as that of Panama or Iraq. That is the true internationalist approach today. Only overcoming these enormous difficulties can the popular majorities cease to be hostages of a deaf dispute over state power between the Bolibourgeoisie and the US-backed opposition. No matter how small the possibility of advancing towards our own emancipation, we must fight for it.